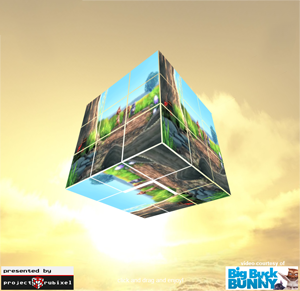 html5cube is a 3D puzzle cube with video, all written using the html5 canvas. Quick instructions: Click and drag the cube to rotate it. You'll get the hang of it. html5cube was done for fun, to help with my cube addiction, which generally finds itself in the form of project rubixel. IMPORTANT: Unfortunately you don't have a browser that supports HTML5 Video. You'll need one. Other browsers, whilst compliant, are not really up to it performance wise. And the video is being served off this server, and while it's only 3MB, apologies if it gets congested and slow.